This video describes the use of an over-the-scope clip (OTSC) in treating the chronic peptic ulcerations with refractory bleeding that fail angiographic embolization and endoscopic treatment respectively. The first patient was an 89-year-old woman with recurrent bleeding from a 2 cm chronic bulbar ulcer. This patient was firstly treated by angiographic embolization to her right gastroduodenal artery (GDA), but 3 days later again developed massive bleeding. With endoscopy, a pulsatile vessel was seen at the base of her ulcer. We used OTSC to encompass and closured the vessel. On reviewing her angiogram, we found that coils were deployed in the proximal GDA. A pseudo-aneurysm was seen arising from a branch off GDA. This patient was discharged 4 days later without further bleeding. Figure 1. Angiographic view of gastroduodenal artery. 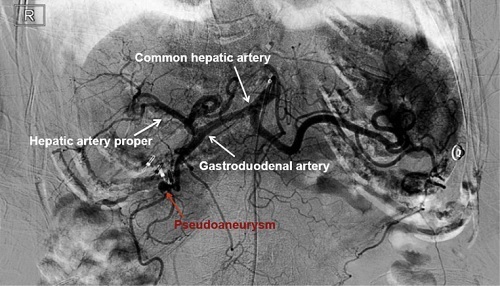 Pseudoaneurysm to a branch of gastroduodenal artery (GDA). The second patient was a 76-year-old man with history of recurrent upper gastrointestinal bleeding from a chronic gastric ulcer. He was on warfarin for treatment of pulmonary embolism complicating deep vein thrombosis. During endoscopy, we attempted to stop bleeding with hemo-clips and heater probe thermo-caogulation. We used an anchor device to puncture into the ulcer base next to the bleeding artery and then deployed an OTSC over the artery. The patient had an uneventful recovery and was discharged on aspirin and a proton pump inhibitor. Left, embolization of coil deployed in the proximal GDA. Right, over-the-scope clip (OTSC) encircling the pseudoaneurysm. These videos show how OTSC are used in treating ulcers with bleeding difficult to be controlled using standard endoscopic methods. These two cases are classic examples. Without the use of OTSC, the patients with significant comorbid illness would require surgical control to bleeding. The videos illustrate nicely how an OTSC would work; it compresses on the artery by ‘clamping’ on tissue at the ulcer base. The high retention rate in subsequent days would mean that hemostasis is durable. One of the videos also shows how an anchor device can aid in the accurate positioning of an OTSC. With aspiration, surrounding tissue can come into the aspiration chamber leading to malposition of OTSC. The anchor device can guide the transparent hood. With minimal or even without aspiration, one can target the vessel with OTSC. I personally would use the anchor device in ulcers located at difficult positions, e.g. lesser curvature of the stomach with endoscope in a retroflexed position and bulbar duodenum requiring tangential clip application. Endoscopists should consider the use of OTSC when tackling challenging bleeding lesions especially when other standard treatments have failed and certainly before referring your patients to surgery.